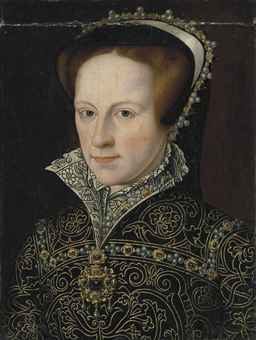 During her brief five-year reign, from 1553 to 1558, Queen Mary I restored Catholicism to England after her father, King Henry VIII battled with the Vatican and eventually declared himself head of the Church of England. Queen Mary executed so many Protestants during that brief reign that she earned the nickname "Bloody Mary." She clamped down so hard on Protestantism that hundreds of thousands of Protestants were forced to flee England. It was somewhat of a miracle that Mary came into royalty and then became crowned as queen. In those days women rarely sat on seats of power. The Kings of Europe went out of their way to father sons to succeed them to the throne. She was the only child of Henry VII and his first wife, Catherine of Aragon. Her younger half-brother, Edward VI, the son of King Henry and Jane Seymour, was a child when he succeeded Henry to power in 1547. When he was only 15, Edward became mortally ill and died in 1553. Because of her Catholic faith, Edward attempted to remove Mary from the line of succession. While on his death bed, he nominated Jane as successor to the Crown in his will. Thus it was that on his death, Lady Jane Grey was proclaimed the queen. Her reign lasted only nine days. Mary would not give up what she believed was her legal right to the throne. She and her supporters assembled a military force at Suffolk that successfully deposed Jane. Jane was convicted of high treason and beheaded. Mary was not only Queen of England, but also Queen of France and Ireland. She married Philip of Spain, becoming queen consort of Habsburg Spain. She and Philip had no children. In the restoration of Roman Catholicism, Mary had over 280 religious dissenters burned at the stake. Mary became ill and suffered in great pain from what historians believe was either ovarian cysts or uterine cancer. She died at age 42 at St. James’s Palace during an influenza epidemic. Mary’s sister, Elizabeth, succeeded her to the throne after Mary's death in 1558. Elizabeth then reversed Mary’s work and brought Protestantism back.